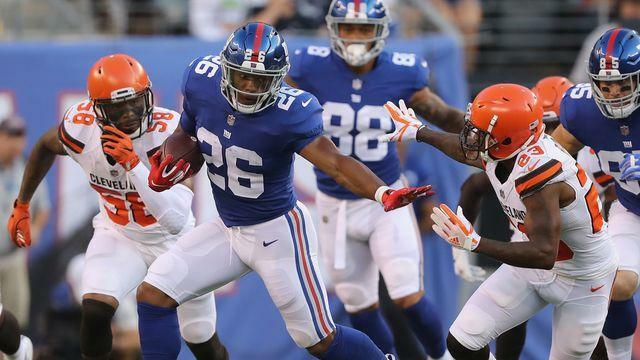 Fans attending the Cleveland Browns-New York Giants preseason game last week were able to place legal bets on their cell phones. The duration of the Giants-Browns game was shown on one of the six big televisions inside the FanDuel sportsbook, and betting was available before the game, along with a halftime line. The book filled up as the Giants-Browns game went along, though the loudest consistent cheers were on baseball games. Per DraftKings, there were no restrictions for mobile betting at MetLife, and in-game wagering was available until late in the fourth quarter, when the Browns were up 20-10 and the game was taken off the board. Shuttles were available to take fans between MetLife Stadium and the sportsbook, a distance of roughly a mile. A $30 parking pass was required for parking lots. The Browns closed as consensus 1-point favorites at Las Vegas sportsbooks, on the DraftKings app and at the FanDuel sportsbook. Thursday night was the first evidence of how big a potential regional betting bias can be. FanDuel told ESPN that the game was responsible for 30 percent of its overall football handle on Thursday night, while a Westgate Las Vegas SuperBook oddsmaker estimated that number closer to 10 percent. Legal sports betting won’t arrive in Pennsylvania for the kickoff of football season. It became clear Wednesday Pennsylvania will not be ready to launch sports betting by the start of the 2018 football season, which is a little like a department store opening after Black Friday. But with the passage of a new batch of regulations, officials believe they are now ready to field for applications from the state’s casino operators that could lead to legal sports plays by the time your favorite football teams have rounded into mid-season form. New Jersey’s tax revenue for legal sports betting has started a little slow, but experts say its still too early to be disappointed. New Jersey collected $325,000 in tax revenue from the first month of sports betting, and that will have to pick up drastically for the state to hit its $13 million yearly goal. Experts say there are too many variables to accurately assess the results of the Division of Gaming Enforcement’s monthly report released Tuesday, since only three casinos offered betting through July, and with football season on the horizon. “I really wouldn’t know what to have expected. There’s a lot of variables there, when you’re only talking about three casinos,” said Brian Tyrrell, professor of Hospitality and Tourism Management studies at Stockton University.